1. Email claims to be from Citibank asking you to confirm your account data by clicking on the link. 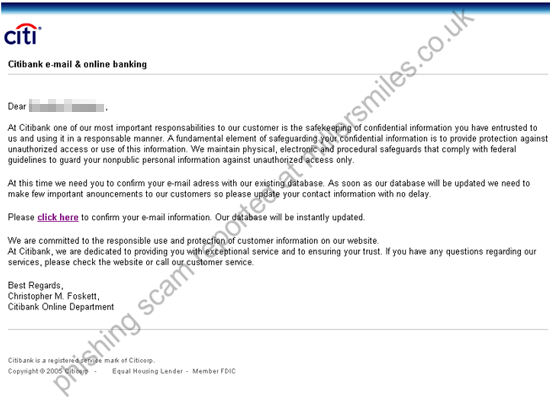 You will be taken to a spoof login page where your details will be captured by the phishers. 2. Citibank never send users emails requesting details in this way. 4. Real URL looks VERY like Citibank, but is just chosen for it's close resemblence - do NOT be fooled! 5. Website traced to Fairmont, West Virginia , United States. 6. 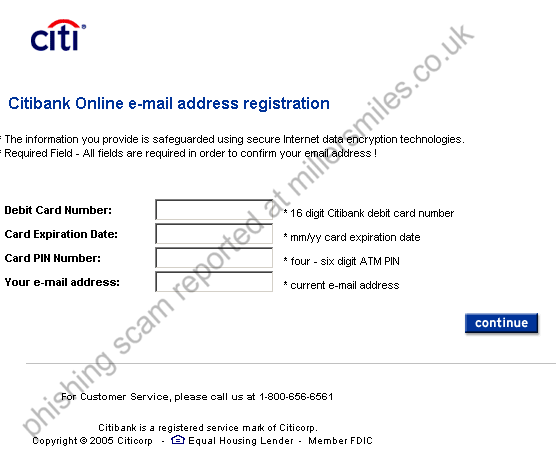 Spoof website actually loads as a popup in front of the REAL Citibank page, to make it appear more genuine.
" Dear x , At Citibank one of our most important responsabilities to our customer is the safekeeping of confidential information you have entrusted to us and using it in a responsable manner. "